Cornell University Invented a Bike You Can’t Steer… For Science? Meet the "Bricycle" -- a modified bicycle built by Cornell University engineers to test what it would be like to ride a bike in zero gravity. What they found is that although we blame gravity when we fall off a bike, without it, you'd be unable to steer. Apparently, prison can be pretty boring. That's on top of it being, well, prison. Plus you've got all that potential labor just sitting around doing nothing terribly productive. Why not utilize it? That's what Santa Rita do Sapucaí prison in Brazil is doing. For every 16 hours prisoners put in on a set of special bicycles, they will remove a day from their sentence. You see, these bikes are charging batteries from the effort. So they're trading hard time for the most literal form of manpower in existence. Yannick Read, who some may remember as the creator of the BOND bike, is a bicycle insurance company owner by day and an evil bike designer by night. With all of his projects, his goal seems to be to chide drivers and raise awareness of cyclists in the U.K.. His latest creation is The Hornster, and it packs an air-powered train horn on the front of a two-wheeler. Bike lanes, while useful, also carry their fair share of danger when motorists simply aren't aware that a cyclist is in their vicinity. 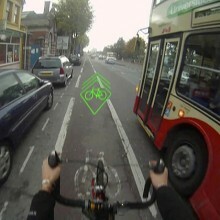 But, a new laser-based signaling system to alert motorists to the presence of cyclists may solve the problem by projecting a bright green bike symbol onto the pavement ahead of a cyclist. BLAZE is a small, battery operated device that can be attached to the handlebars of bicycles, motorcycles or scooters. It projects a bright green laser image onto the road ahead to alert other motorists that there is someone in the bike lane. The image can be made to flash to increase visibility and can even be used in sunny daylight conditions. The device was created by Emily Brooke, a final-year design student at the University of Brighton in England. Brooke worked to develop the system with road safety experts, the Brighton & Hove City Council, the Brighton & Hove Bus Company and driving psychologists. Cambridge, Massachusetts has come up with a creative way to support its increasingly bike-loving populace and to encourage people to opt for green transport. 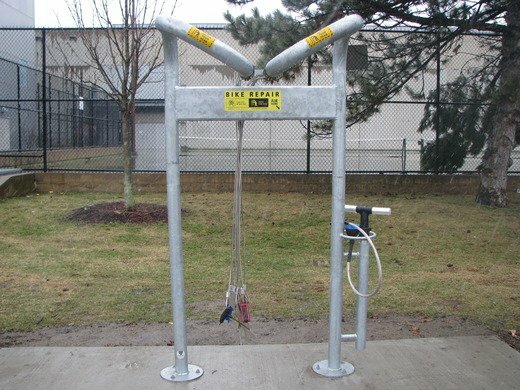 The city has installed three bicycle repair stations around town. 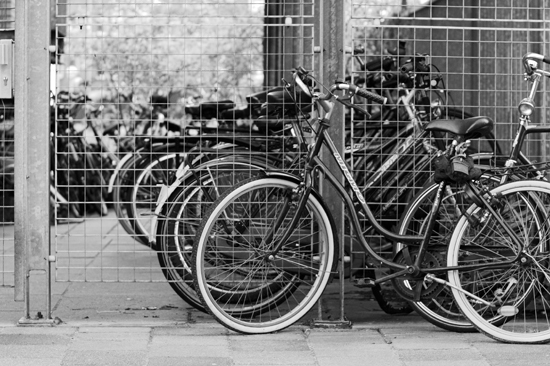 Cyclists can drop by the spots in Harvard Square and make minor repairs or inflate their tires. Cambridge's transportation manager says the city was inspired by MIT, which already had bike repair stations. The stands provide tire gauges and pumps, Allen wrenches and a few other tools that enable cyclists to make minor repairs, such as adjusting seats or handlebars. Each station cost the city about $1,000 and Seiderman said the city got the idea from MIT which has already installed repair stations around its campus. The installation of the repair stations comes as the city has seen a growing number of people riding bikes through Cambridge. A study conducted by the city estimates that the number of people bicycling in Cambridge more than doubled between 2002 and 2008, based on a study of the number of cyclists counted traveling through 17 different intersections. Seiderman said the number has continued to rise since 2008. 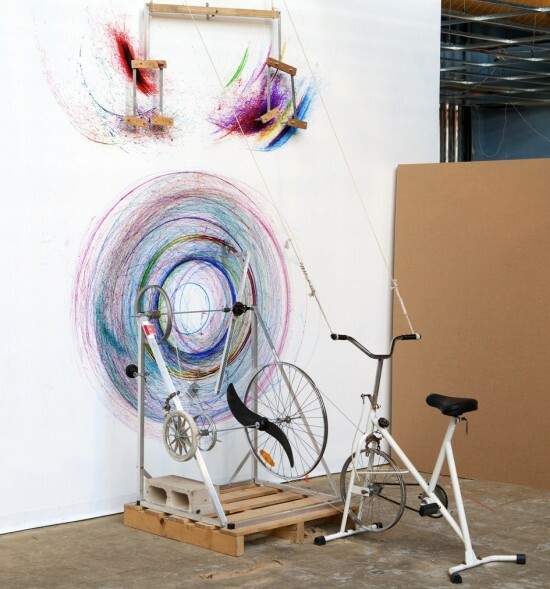 Artist Joseph L. Griffiths has devised a bicycle-powered drawing machine which creates colorful gyroscopic patterns of varying sizes on walls with the turn of a set of pedals. Per Neatorama, "His interactive installations explore man’s relationship with machines and involve the audience in the creative cycle."